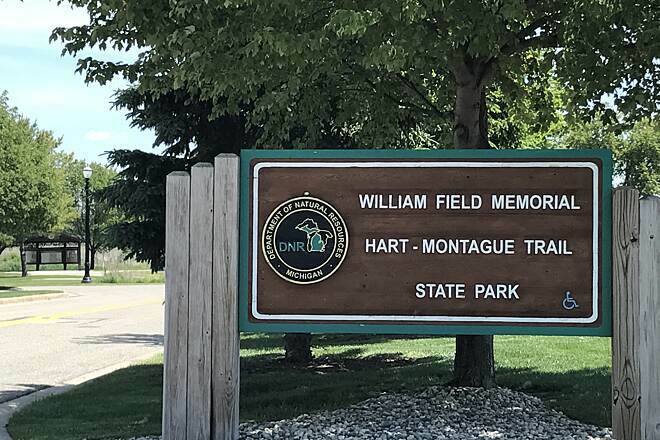 The name tells the tale of the William Field Memorial Hart-Montague Trail State Park. 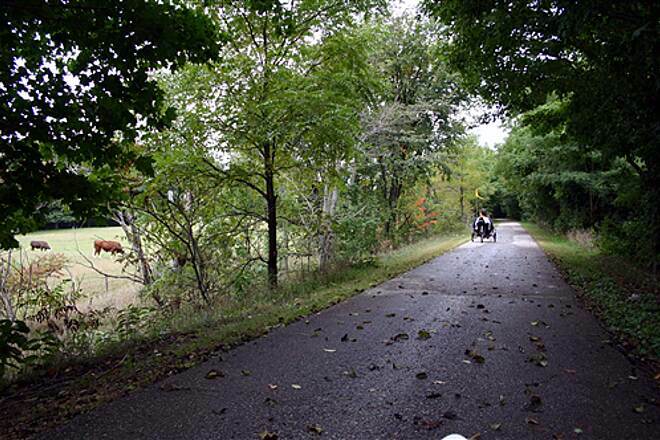 Rolling for 22 paved miles through the farms, orchards, and forests of western Michigan between Hart and Montague, the trail may never have come into existence if not for the late William Field. 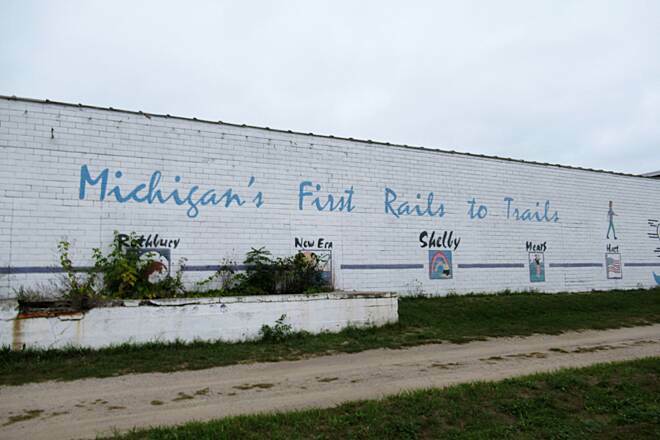 As a fruit grower from Shelby and an Oceana County commissioner in the early 1980s, Mr. Field couldn’t raise interest among his fellow commissioners to turn the re-cently dismantled railroad into a recreational trail. Fearing a lost opportunity, he bought the corridor in 1982 and donated it to the state. 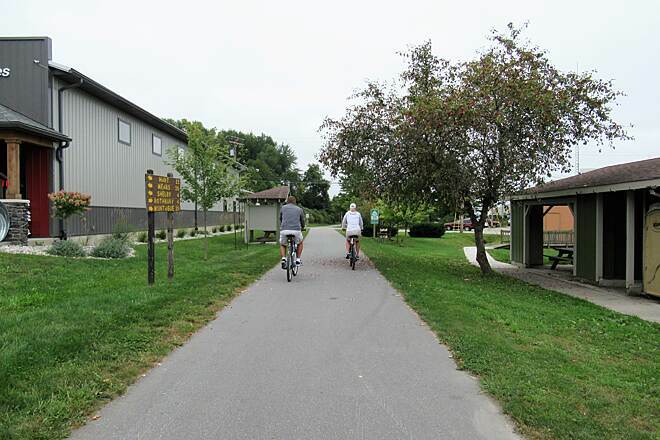 Seven years later, the trail’s northern half opened as the state’s first paved rail-trail, followed in 1991 by the second half. 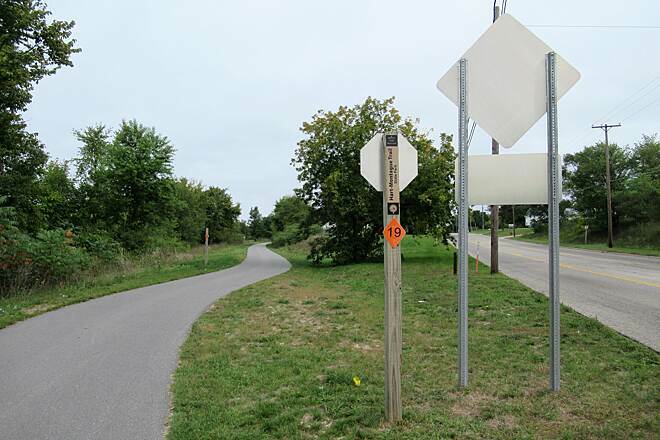 The state legislature honored his efforts by naming the trail for him in 2014. 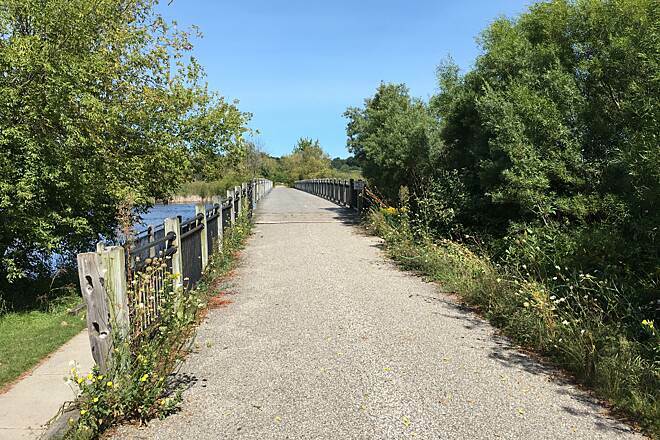 In 2016, the state completed a yearlong face-lift for the trail, which included asphalt resurfacing and widening to 10 feet. The Chicago and Michigan Lake Shore Railroad originally built that rail bed in 1872 as a segment of its route from New Buffalo to Pentwater. It later came under control of the Chicago and West Michigan Railway, the Pere Marquette Railroad (depots still stand in Hart and Shelby), and the Chesapeake and Ohio Railway. CSX Transportation removed the tracks between Hart and Montague in 1982. 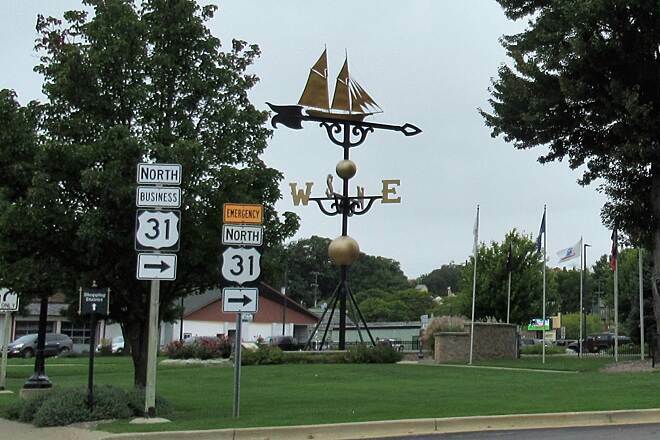 Starting in Montague next to a campground on White Lake, a 0.2-mile side trip via the connecting Medbery Bike Trail takes you to the world’s largest working weathervane on the corner of Dowling and Water Streets. The 48-foot-tall structure is topped by a replica of the Ella Ellenwood, a 19th-century schooner that carried lumber on Lake Michigan. 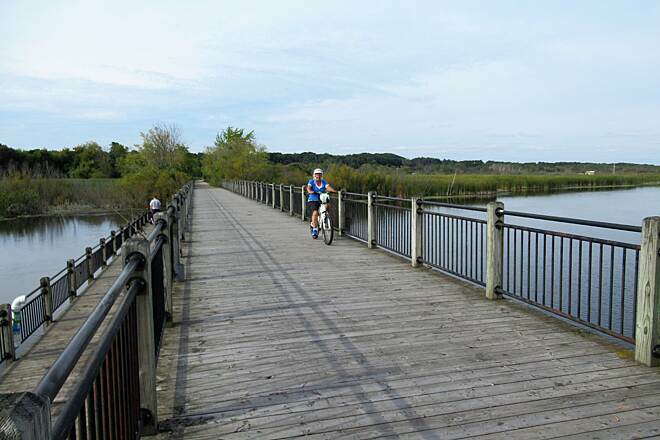 Another trail, the White Lake Pathway, crosses White Lake into Whitehall, where it meets the Fred Meijer Berry Junction Trail, which goes south toward Muskegon. Heading north on the William Field Memorial Hart-Montague Trail, you’ll pass Christmas tree farms, orchards, and the 100-acre Clear Springs Nature Preserve on the way to Rothbury (mile 6.2). Be on the lookout for deer in the fields and orchards, especially in the morning and evening. 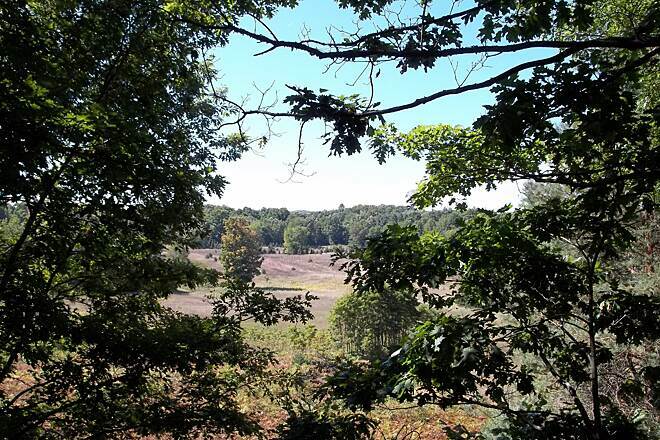 A 4-mile section between West Fruitvale Road and Rothbury is open for horseback riders. 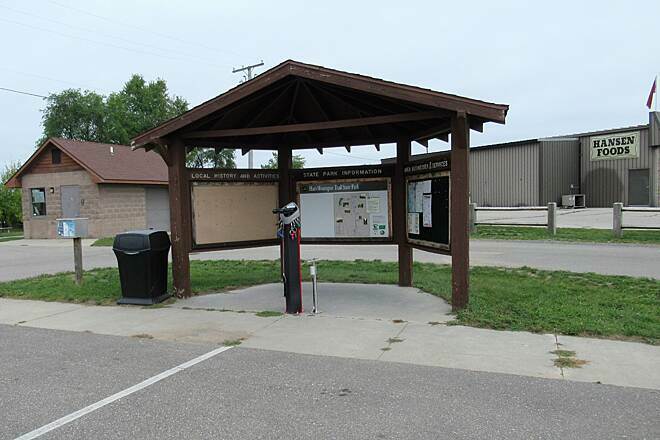 The village of New Era (mile 10) is near the halfway point of the trail, and during the summer you can stop for homemade ice cream at the trailside dairy bar. Another 4.3 miles up the trail, the village of Shelby gained renown in 1876 as a hunting center for one of the last mass nestings of now-extinct passenger pigeons. In 5.8 miles, the trail brushes the southern edge of Mears, another food and water stop. 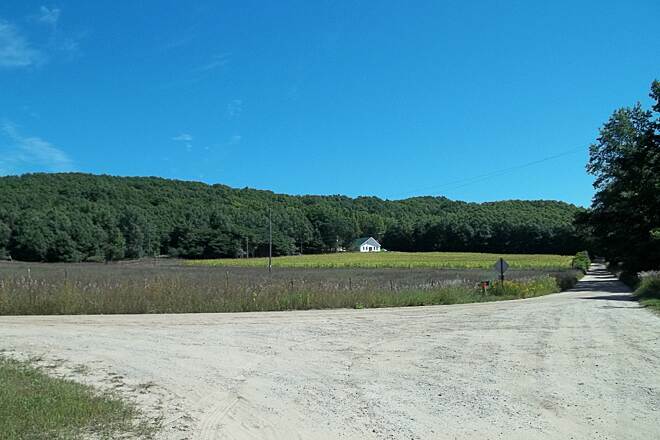 The farmland here gives rise to Oceana County’s claim as the Asparagus Capital of the Nation. If you arrive in Hart during June, you might see the National Asparagus Festival, complete with a parade and crowning of an Asparagus Queen. 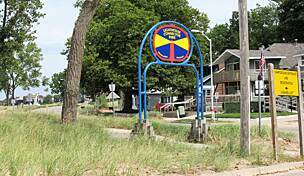 Any other time, you’ll find Hart is the gateway to the beaches and giant sand dunes of Silver Lake and Lake Michigan. 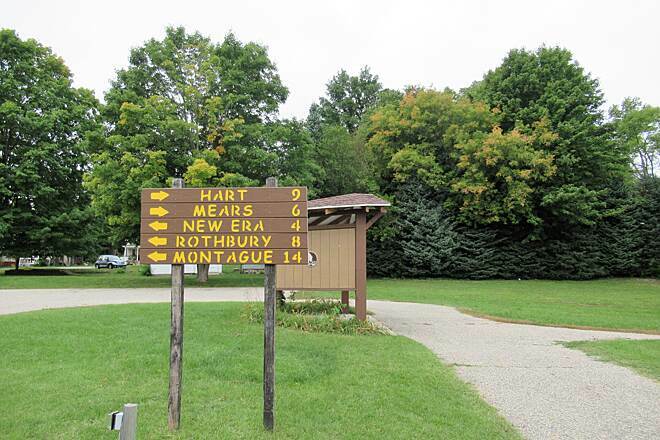 To reach the southern trailhead in Montague from US 31, take the Bus. US 31 exit toward Montague and Whitehall, heading west. Go 1.8 miles on Bus. US 31/E. Colby St., and turn right onto Bus. US 31/Thompson St. Go 0.5 mile—Thompson St. becomes Dowling St. on the other side of White Lake—and turn right onto Bus. US 31/Water St. Go 0.1 mile, and turn right onto Spring St. 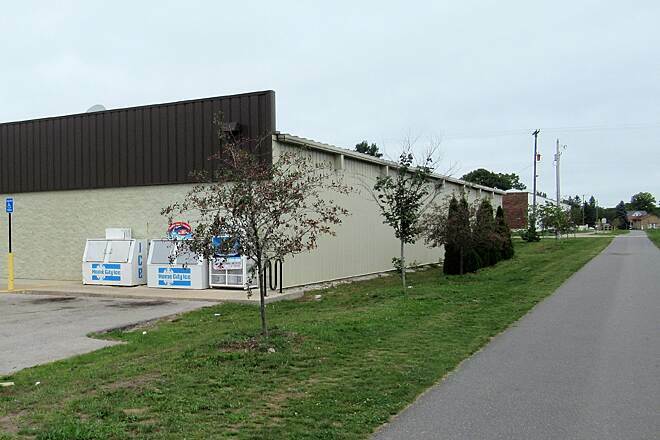 Parking is at the end of the block on the left, behind Whitehall Products. 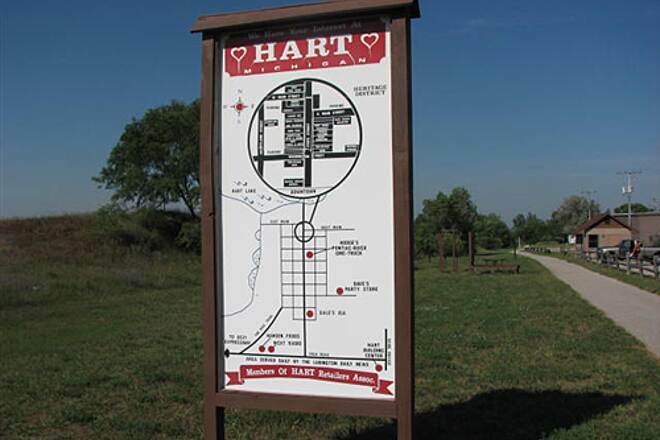 To reach the northern trailhead in Hart from US 31, take Exit 149 east toward Hart on W. Polk Road. Go 0.8 mile, and look for parking on the left. The northern terminus is 0.6 mile up the trail. In its current wonderful condition, this trail is the Gold Standard. We’ve done Montague to Shelby and back, and New Era to Hart and back, on separate occasions. We’ll eventually do the whole thing up and back, but that’s a long day for us, as we drive up from Kalamazoo. Of the 2, we like the New Era to Hart ride the best, as there are many wonderful wooded sections. This trail is a gem. I wish they were all like this! I rode the portion of the trail between Hart and Rothbury. 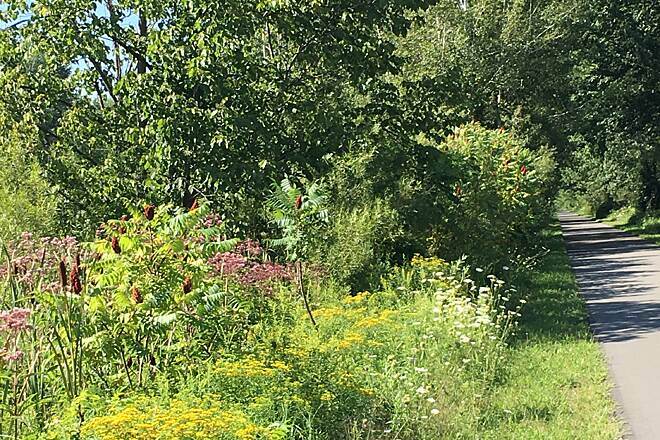 It is a very pretty trail with a lot of variety. There are a lot of forested/shady sections north of Shelby. Further south the trail opens up some. 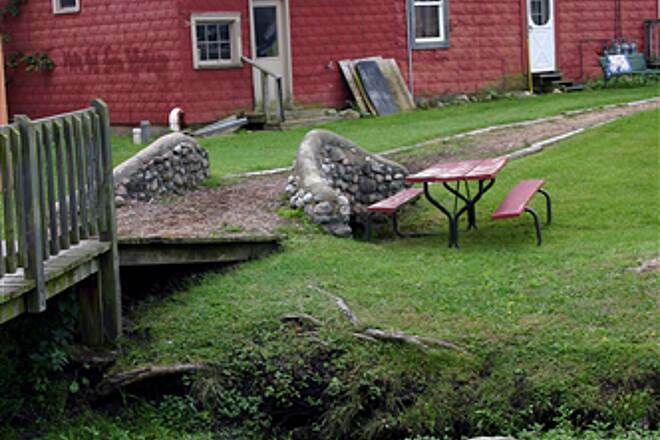 There are many options for food in the small towns along the trail. Taqueria El Paisano in Shelby has very good and authentic Mexican fare. The surface was in very good shape. I wish the signage for finding the trailheads was better. There was nothing on M-20 or in Shelby telling where to find parking for the trail. Good, flat riding. Lots of tree cover & shade. We started out at Hart and went to Shelby & bike. 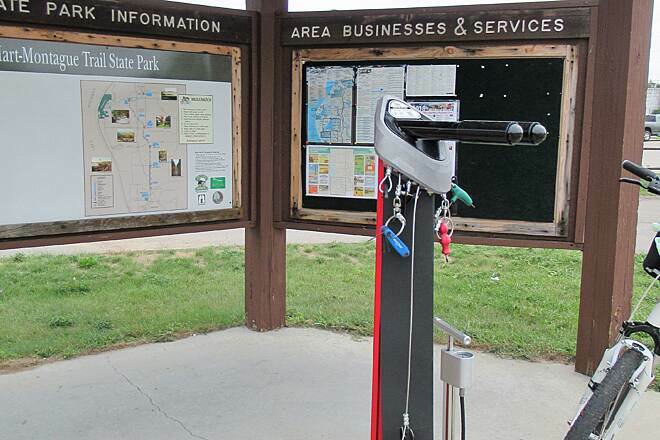 Good info on POI in Hart at the N trailhead. 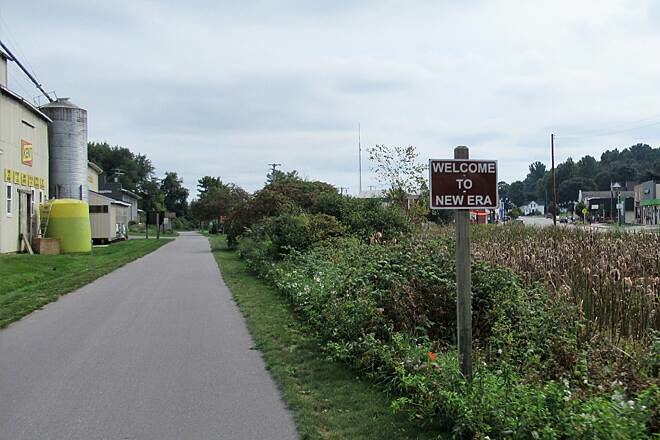 Rode from the campgrounds in Montague just past New Era and it was a very quiet, peaceful ride. Surface was very smooth and flat and would be great for inline skating. Saw only several people and all have a smile or wave. Occasional flowers and cat tails along the way made the trail very pretty. Loved it! 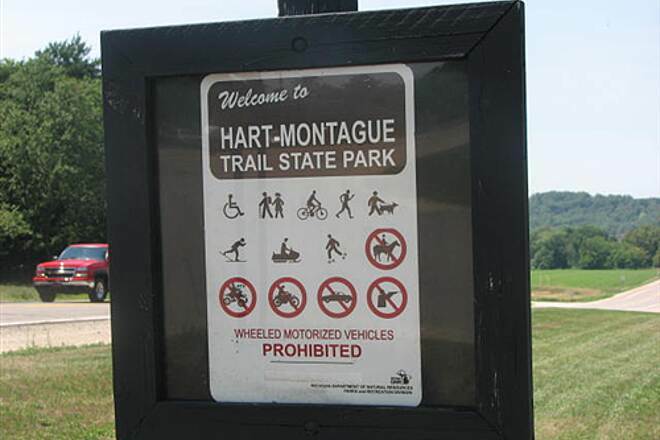 My first ride on this trail was shortly after it was introduced and was called The Hart/Montague rail trail. 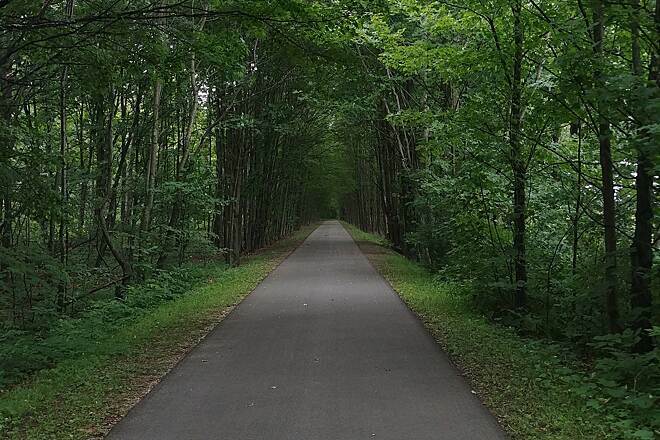 Since that time I've ridden many thousands of miles on the White Pine trail from Grand Rapids to Sand Lake and also the Musketawa trail from Grand Rapids to Muskegon. I tell my buddies who ride the trails in GR, they have to experience Hart/Montague - William Field as it's smooth as butter the entire route. Now if we can get White Pine and Musketawa redone!! We parked on a side street in New Era, midpoint of the trail. A local suggested we go north toward Hart, so we did. Great ride with wonderful scenery. Not much change in grade. On the way back we stopped at The Farm Store. 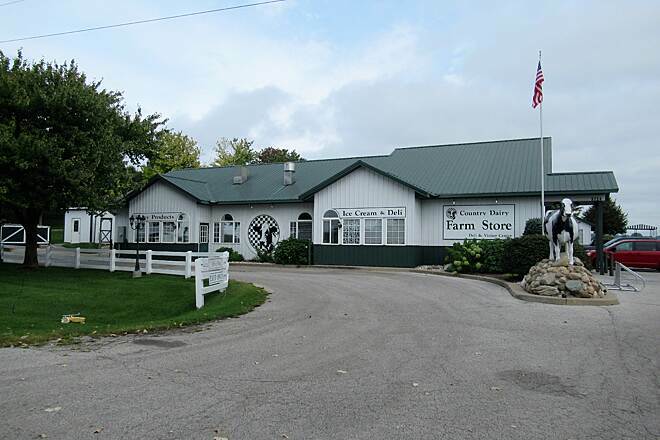 Quaint with farm tours for purchase and ice cream and other food items for sale. Although the trail never really takes you to a place with a WOW factor, it does offer scenery and mostly a quiet ride...except for the highway noise from time to time. I rode from Montague to Hart and then on back and up to the White River lighthouse which is a nice finish to the ride...sunset at the lighthouse watching the sailboats. On the return from the lighthouse, I was lucky to see the Northern Lights over the Whitehall Landing area...awesomely beautiful!! Plenty of stops along the way to fuel up the body,lots of nice people along the trail, too! We rode on a Saturday and really didn't see many other bikers. The weather was good even though it had rained that morning leaving some of the shade areas still wet with debris. We had a hard time finding where to park in New Era so we ended up driving to Hart, and had some trouble there as well. Signage is lacking. 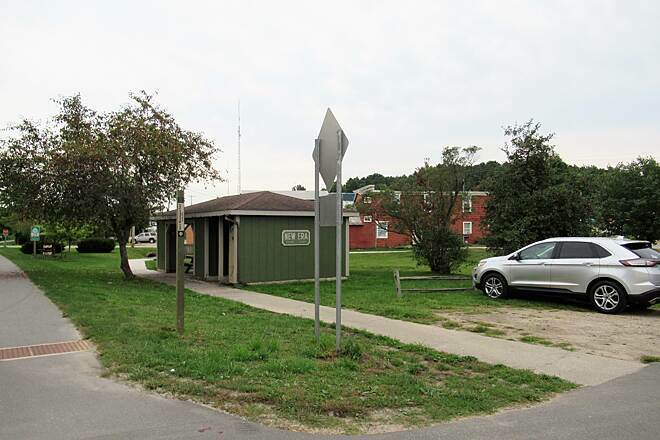 Look for the police station and you'll find a great parking area across the street with a nice restroom. We rode about 11 miles to the Country Dairy and my oh my was it ever worth it! They have the best butter pecan ice cream I've ever eaten and their chocolate milk is divine. Loved the trail and the beautiful scenery. Very quiet and peaceful with beautiful orchards along the way. Awesome trail. Very smooth all the way through as far as I can tell. Every town you pass through has a nice staging area with a pavilion. Initial stretch from Montague to Rothbury is great with woods on both sides. 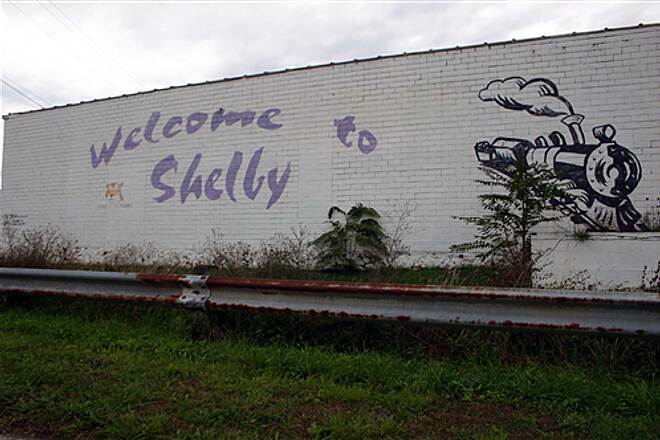 After that it opens up to beautiful farmland all the way to Shelby. Awesome trail. This trail is absolutely beautiful. There are plenty of stops along the way so you can always find a rest break.We really enjoyed riding to Hart, having lunch and then returning. Definitely want to come back and ride this again. We rode this trail on Saturday July 16, 2016. Perfectly smooth all the way from Montague to Hart. Trail is flat and fast but also very scenic. Mile markers are posted along the way. Love the historic feel of the trail as we rode in to the various towns along the way using the same route the old trains took. 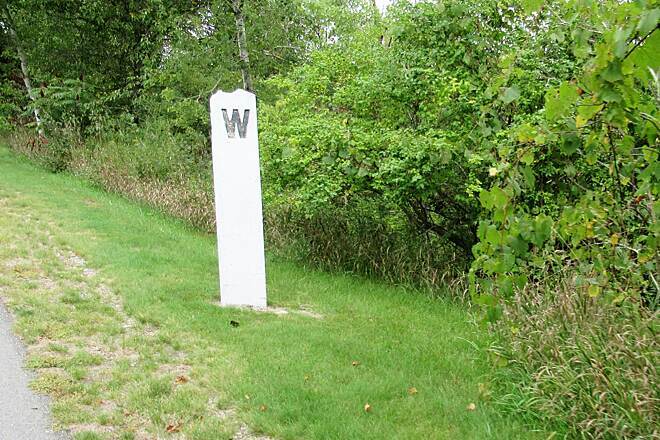 There are also some historic cement markers along the way with the letter "W" on them. Those most probably date back to the time the route was a rail road line. Since the re-pave, it's smooth as glass. When we went through, they were still working on a bridge here and there, but it's definitely a huge improvement from the bumpy ride it used to be. Lots of shade and scenery. Got to see a doe and her fawns cross the trail at one point and actually had to herd the last fawn across. Pretty cool. Wife and I rode the trail this past weekend from Montague to Hart and back. Almost the entire trail is done, there was still one bridge being worked on over a creek. Now that it has been widened to 8 feet there was plenty of space when meeting bikes, skaters, and walkers. Only change I would have made, taking the upwind direction first :-) Near the halfway point Country Dairy is a great place to stop for food, or ice cream. And now the section from Shelby to New Era is done and open...very nice!! The surface is smooth and the shoulder is re-seeded. This trail is one of the best! The section from Shelby to Hart is done and open now. Trail is really smooth and fast...nice!! This path is closed from New Era to Hart. Wish we had known.It would be nice to have had some kinda notification after our three hour drive. Should be posted on website. My husband and I rode biked from Hart to Montague and back. Although the trail was completely paved, there was rough stretches of pavement along the way. The stretch from Rothbury to Montague was newly paved, so that was a welcomed relief after many bumpy sections. 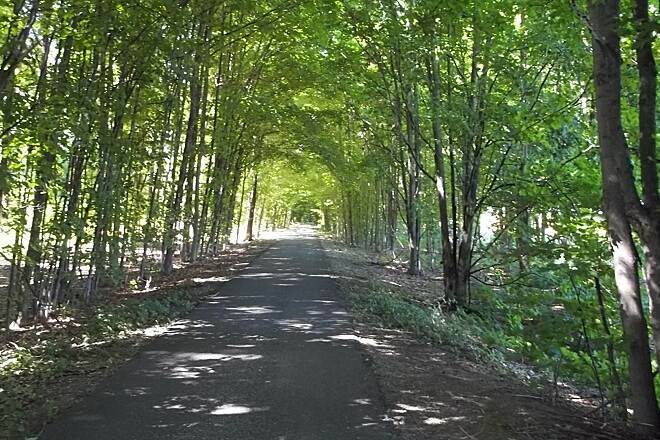 It is probably ok for other bikes and walkers, but as nice as this trail was, I would not go back until the entire trail is repaved. 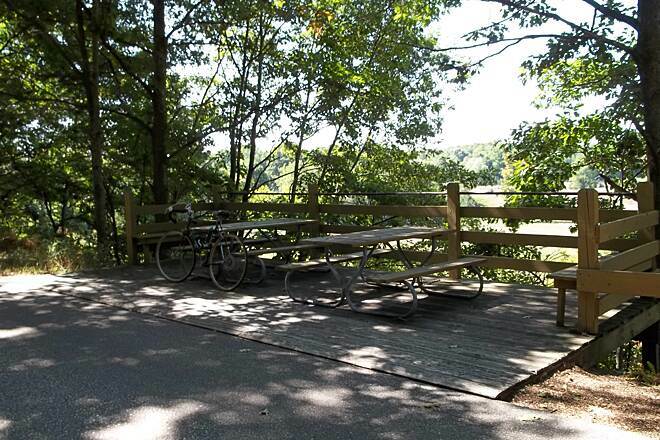 I don't want to discourage road bikers from this trail, because it is scenic and obviously doable. 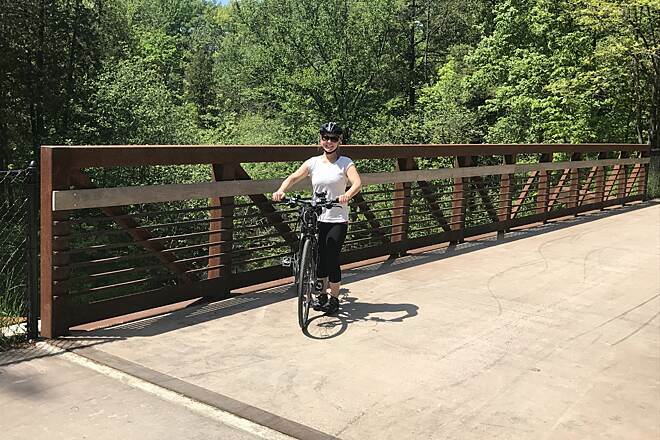 Started our ride on the south end of the Berry Junction Trail, and continued on the newly re-paved first 7 miles of the Hart Montague Trail--Lovely! 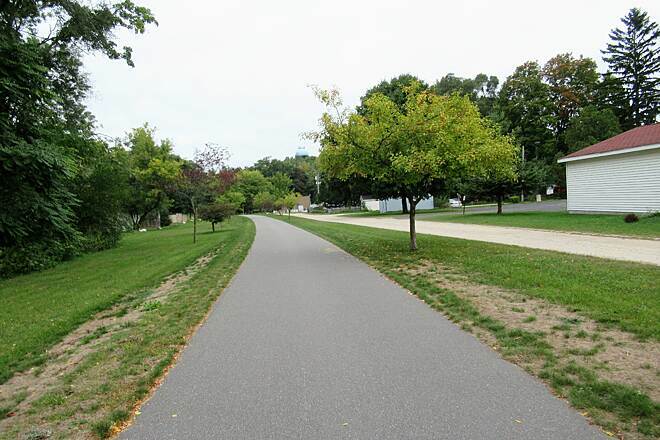 We are eagerly anticipating the re-paving of the rest of the trail! 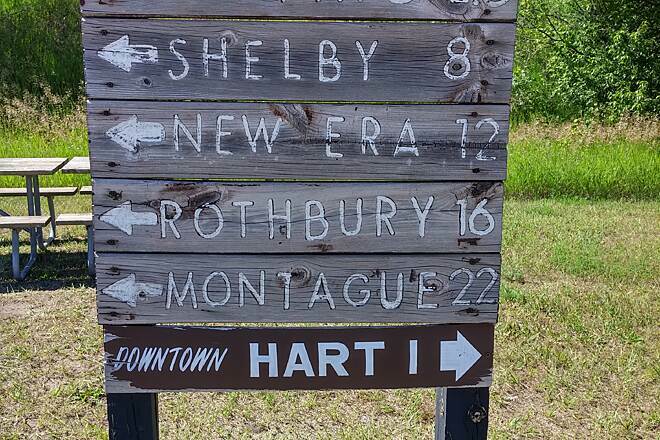 Started at Hart and didn't quiet get to Montague. Turned back after Rothbury. Some cracks but manageable on longboard. Not very many places to stop to get water. Especially after Shelby. I would love to do this again but this time get to Montague. It's a great trail. People up there are lucky to have this close by. How is the condition of this trail currently? I plan on riding longboard (skateboard) but the review below stated 2-3 inch cracks on the path. Any replies would be greatly appreciated. Thank you. 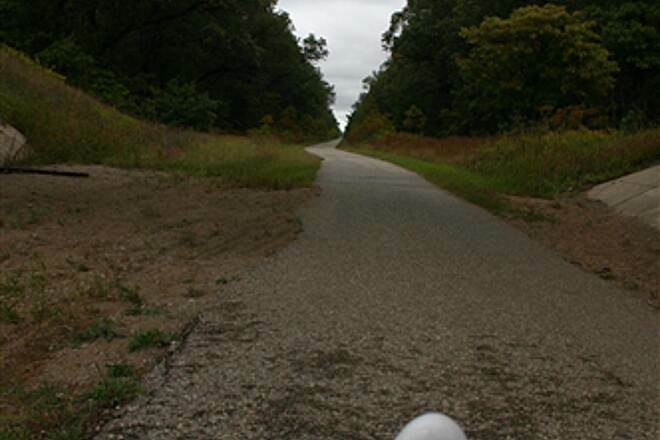 Last September a couple of old guys from Milwaukee (my friend and I) rode our bikes from Milwaukee to Manitowoc, took the SS Badger to Ludington, rode to Whitehall and finished up in Muskegon where we took the Lake Express back to Milwaukee. It was a great trip and we enjoyed the Hart-Montague trail including the dairy farm. The trail did have some cracks but no worse than the trails in Wisconsin. All of the trails are going to be in terrible shape after this winter end! 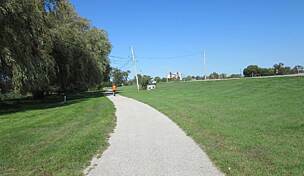 I rode this trail Sept 12th 2011. Absolutely wonderful weather 85 degrees. Traveled north- south and then back north again for the entire trail. Farmland, Orchards, Forest, City, Towns. Everything you want to encounter on a trail is here. 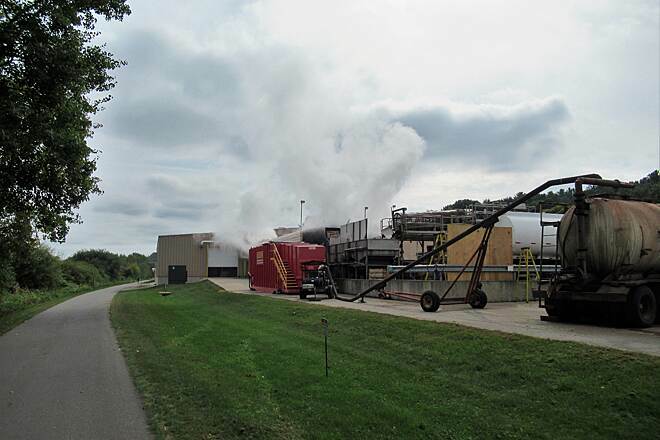 From stinky cow poop smell to aromatic pumkins and lovely squash production. Many Apple orchards and nice little restaurants to rest up and chow down at. Cool little towns too. 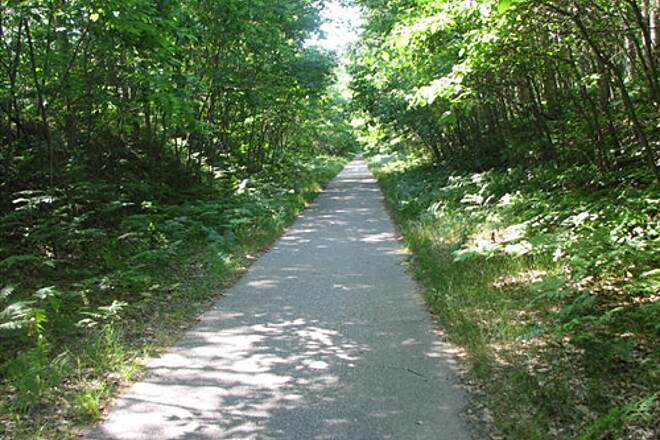 The trail is bumpy in spots, but you expect that from the original rail trail of Michigan. Wonderful cathedral like forested trails. All ashphalt trail can be as fast as you want to go. This trail with be revisited! This trail is just fine. If you're a bike snob and want 0 cracks then this isn't your trail. If you want great scenery and an enjoyable experience, then it is! We used a mountain and hybrid bike and loved the trail. Very scenic and lots of eating choices in Whitehall and Montague. 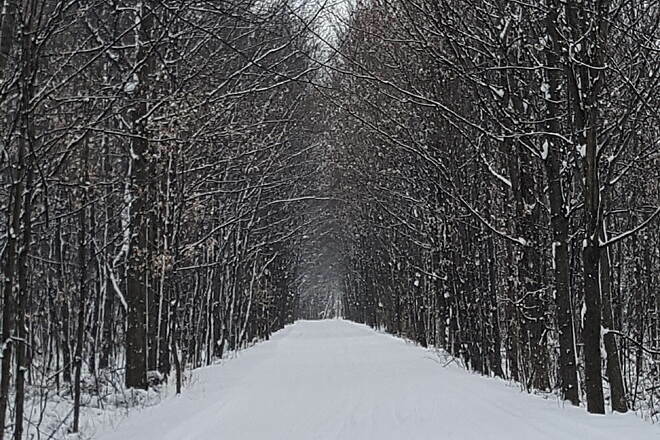 Yes, it could use some work, but this is just another way to experience Pure Michigan! 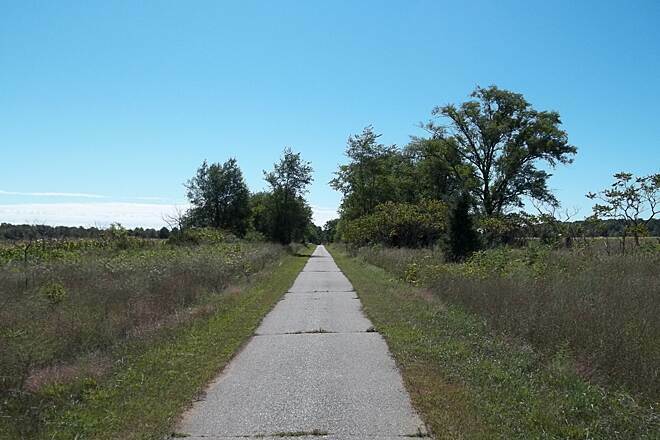 My wife and I biked from Muskegon to Hart and back on July 11th and the path from Montague to Hart had cracks almost every 20-30 feet for over 20 miles with grass growing up through the cracks. The cracks appeared to be 2-3 inches wide. Was worried about getting flat tires. Found the best way navigate these cracks was to ride over the portion of the crack with the most grass sticking out to cushion the impact. I would not ride this path again until it is repaved. Rode north from the parking lot at the White River. Although nicely wooded, we found the trail too rough for our road bikes. Did 10 miles north then decided it was too rough. Would probably be better suited for mountain or comfort bikes. 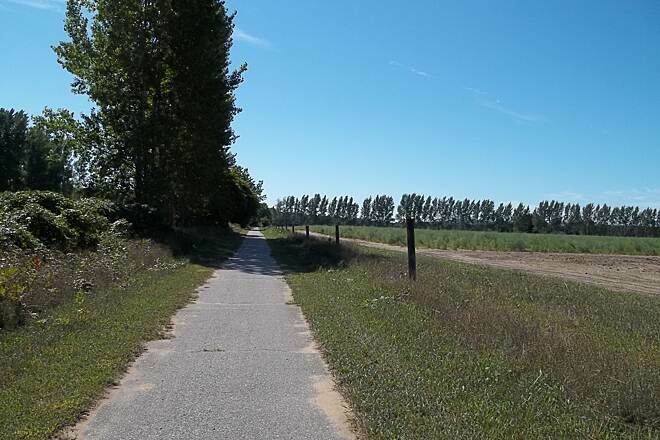 Ended up continuing south and really enjoyed the Fred Meijer trail. Great wooded trail with gentle sloping hills. Paved the entire way with some cracks in asphalt. Good restaurant choices on Montague/Whitehall end. The distance was more like 22 miles. My husband and I rode this trail in September of 2011. It was a beautiful ride despite the bumps and cracks in the asphalt. When we reached the Montague trailhead we spotted a surveyor working for the state . He explained to us that this entire trail was going to be removed, new asphalt will be layed and the trail will be widened. He thought the job would be done sometime in 2012. 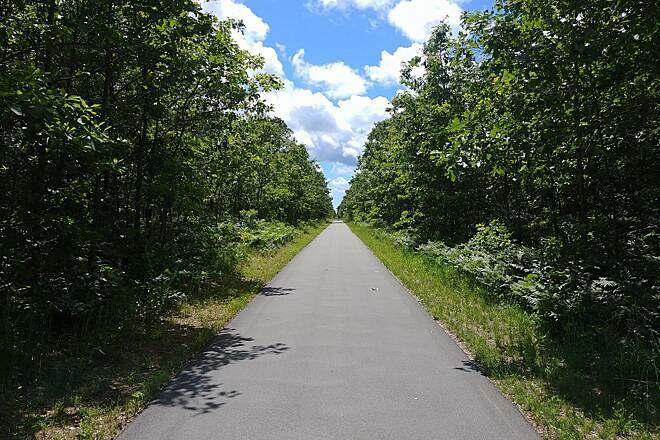 He also explained that the White Pine trail was being paved during the same time from Cadillac to Grand Rapids. We had to see for ourselves. 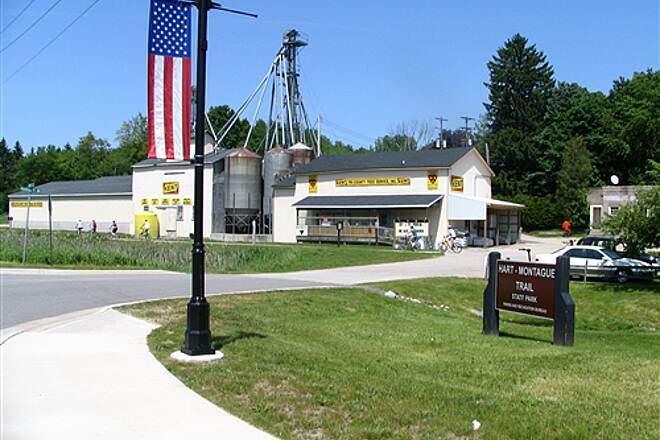 We drove to Cadillac the next day and rode South to Leroy. It was indeed paved and very nice to ride. We had previously rode this trail when it was basically unimproved. 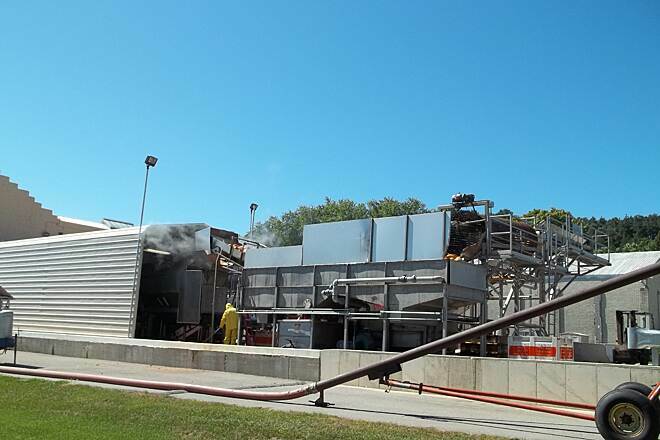 We are anxiously awaiting the completion of both of these projects. 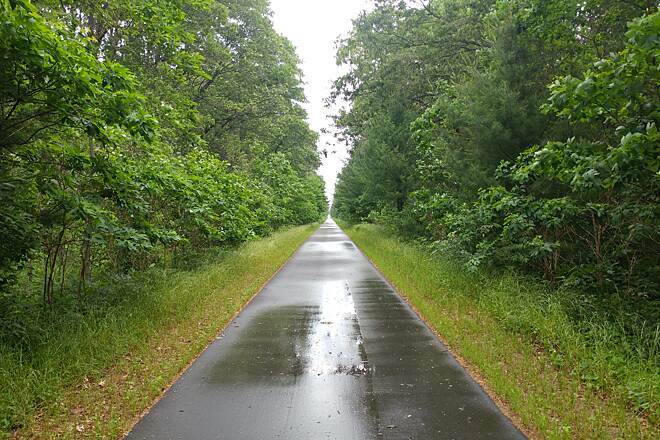 I rode this trail on Sunday, Sept. 25 and had an enjoyable ride even with 16 miles of in the rain. My wife and I found it very difficult to find the route through town from Gorney Park. It would be good if the towns people put up a few signs or marked the pavement. We finally found it on the edge of town across from the state police office and next to Hansen Foods. 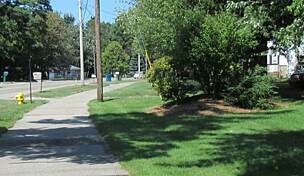 I rode a short distance back into town until I found that it ended at Wood and Waters street. 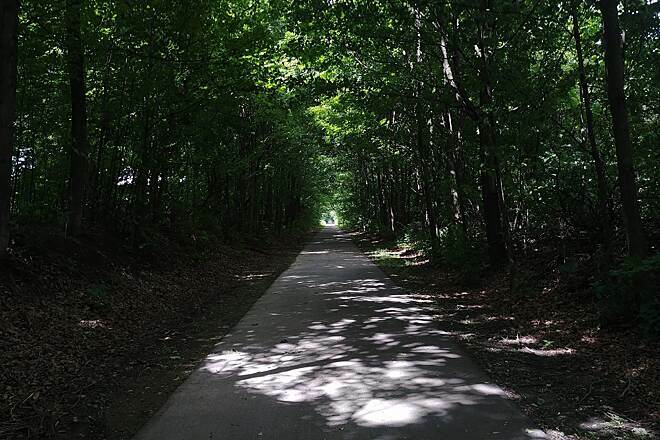 Yes, there were some bumps, but this trail is one of the most enjoyable my husband and I have found in our area since we started riding our trikes. 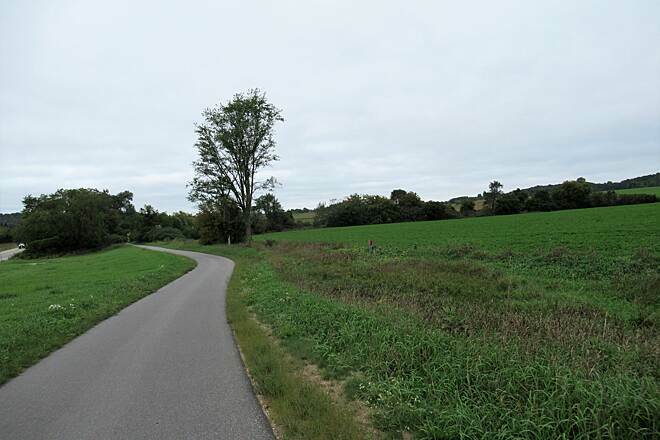 It is relatively straight and has very low grade, mild hills which are easily pedaled. We went from Montague to Hart and back again. While in Hart, we enjoyed exploring the historic district, just one block off the trail. When we got back to Montague, we treated ourselves to some good old-fashioned Dog N Suds, also just a block from the trail. We passed only around 20 people on our entire trek. We were surprised more people are not utilizing this awesome trail. We started in Montague and biked around the area a bit before continuing on the trail. The trail was pretty bumpy and cracked in places for the first several miles. We both rode mountain bikes and the trail was easy but again - if you want it smooth this is NOT the trail for you. This part of the trail seems pretty flat. The cracks run across the entire surface and are now inches wide. Although there is vegetation growing up between the cracks it doesn't seem to help much. We biked to Arthur Road and then biked back it is about the halfway point. The next day we headed to Hart to bike the other half. 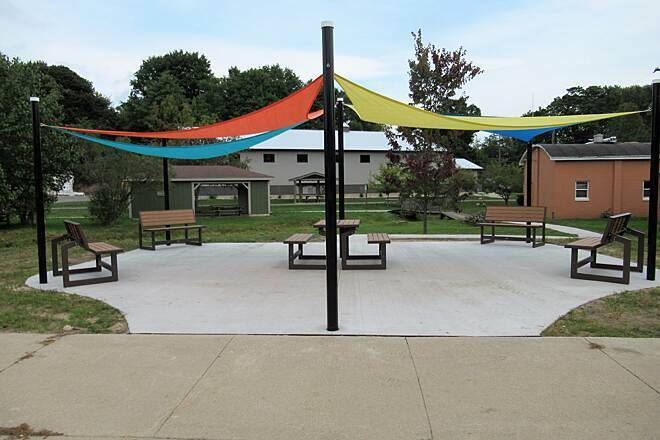 According to a State Park and Trail Guide we had the trail started at The John Gurney Park. It took us awhile to find this little spot tucked back in the small town of Hart. There isn't really a trail head there. There is a small sand lot to park in and a beautiful old arch that once celebrated what might have been a lovely park . Now it is a gateway to a broken down dock and a small launching area and a gated off private RV spot. Once you leave this you bike on a sidewalk like path until - if you're like us - you completely lose the trail and founder around until you bike on streets and roads and work your way back to where you know you crossed the trail in your car. There is what looks like a "real" trail head. 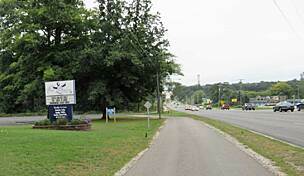 It is on the main road which is Polk Road near the Subway. Once on this trail from Hart south the trail is much nicer. It is just starting to deteriorate and in really good shape compared to the other half. It is woodsy and has more hills than the Montague section. It is a pretty good ride. Much nicer than the other section. We rode back to Arthur Road and returned to Hart. 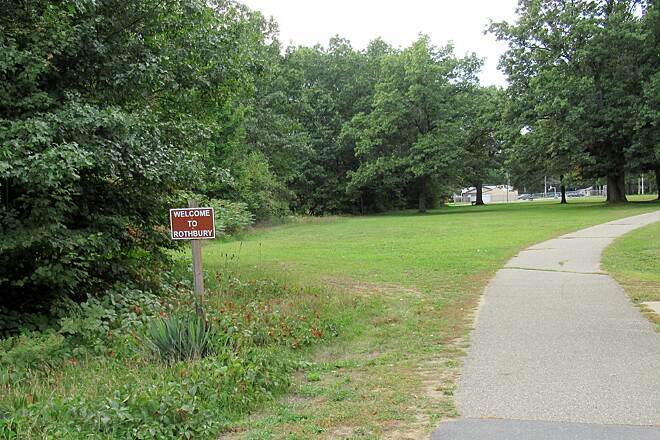 This time we found the trail through town a bit better - but I would still skip the trail head at John Gurney Park. There isn't really anything there to see but the back of a person's house. I first did this ride about twelve years ago and found the conditions of the trail much better than they are now. There needs to be a major initiative to bring up the condition of the trail through major maintenance projects. Since I ride mountain and cross bikes the condition of the trail didn't effect me. However, those that have high end road bikes beware. There are bumps and dips in the asphault that have the propensity of doing major damage to delicate rims and tires. Getting past the current trail conditions I find that the rural beauty is certainly there to enjoy. With the length of the trail I don't recommend tackling the whole length as a family unless all of the riders are accumstomed to riding 44 miles in one day. There are ample places to purchase food and beverages along the way along with many places of interest along the trail. It is certainly a must see experience to say the least. But again, regarding the conditions, make sure that you have tools, tubes and an inflation device in case of break downs along the trail. Upkeep has been poor on this trail and its just plain dirty. Take some wipes to wipe the gritty film off of yourself as it is usually fairly windy and that dirt is raised up as you ride through it. Also, disappointed in the scenery. Hard to find a paved trail of that length but, IMHO, that is all the trail has going for it. Montague is a beautiful spot but the rest of the towns on this trail are typical rural, country blight.......nothing "quaint" in the least. Sorry, but hat's how I see it. 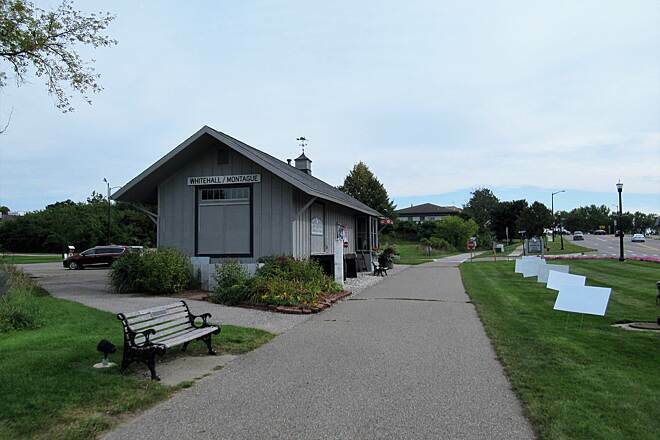 Midland to Clare is the best trail in the state of length and the Saginaw Valley RailTrail, at 9.2 miles, is the gem of the railTrail system in Michigan. Ultra clean, meticulously kept and the restrooms on Swan Creek road are the best kept anywhere. 9.2 miles of diverse scenery. Gorgeous. Out family took to the trail this year from the south. Last year we rode down to the dairy farm (County Dairy Farm, mile marker 11 or so). This year we rode to the dairy farm from the South. Parking in Montague is easy, especially if you need last minute provisions. 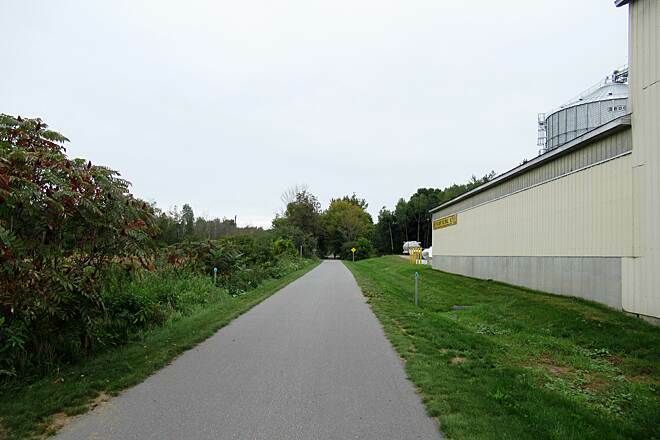 The trail head is right behind the local food market. 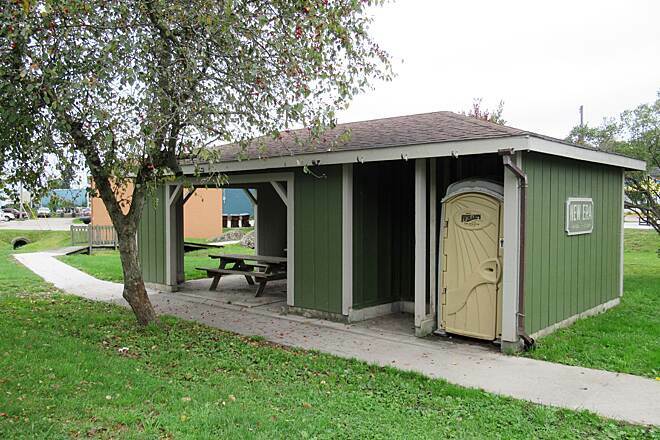 The State Park restrooms were clean and readily available, ideal for the kids prior to leaving on bikes. The State Park campground even looks like a nice place to camp prior to taking to the trail. The trail is good shape, but is showing some signs of wear. All but the most elite road bikes will find the pavement to be acceptable along the entire route. I ride my commuter bike, and the rest of the family is on mountain bikes. We found no problems with the trail. The trail is relatively flat and easily riden by 6 (last year) and 7 year olds (this year), even on smaller 20 inch bikes (last year). This year our kids graduated to 24" multispeed, and the pace was defintely quicker. The state park that is the trail is very nice, some good streams provide places to stop and rest, allowing kids to explore. New Era looked like a nice place to stop, but we were on a mission to get to the dairy farm for the free milk and eat. 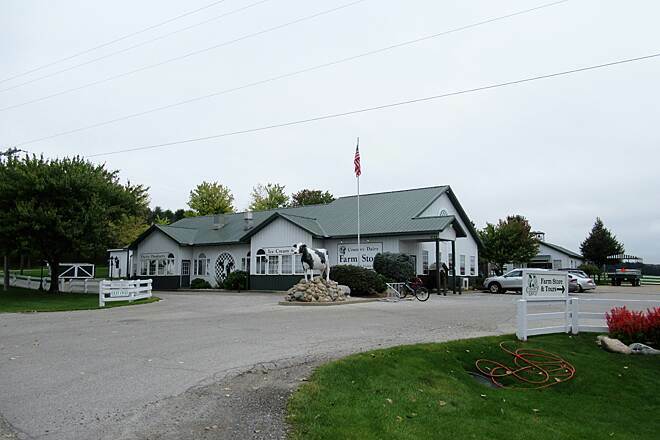 The dairy farm is an ideal stop for the family to grab a bite. Kids love the atmosphere, and the prices are reasonable. Their ice cream is made onsite, and the milk is hormone free. If you were to continue north to Shelby there is a restaurant to eat at, and some nice antique stores. This will likely remain one of our families favorite trails to ride. Maybe it is the scenery, the animals frequently crossing the trail, the places to stop, or all of these that make this a trip well worth it. 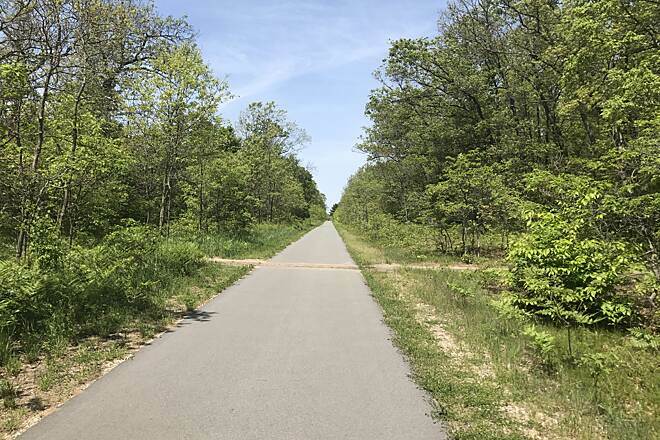 If you were to look a the future planns for Oceana and Muskegon County there is a proposal to link the Musketawa Trail throuhg Muskegon, heading north to link into the Hart/Montague trail. I can only say this if this were to occur you could have one of the best trails routes in the Midwest. From Grand Rapids to Hart, with Ludington in sight. My son and I rode this trail from the marina south of where the trail started all the way to New Era and back. For the most part, it's a nice trail, but we noticed that some of the cracks in the pavement are starting to sprout weeds. The weeds in turn, are starting to make the cracks bigger. Since we were both on road bikes, it gets a little bumpy and is almost bordering on the point where we were starting to worry about bending our rims. The trail is well marked and overall we had a good time, but we ran out of time to complete it. We hope to return soon to do the whole thing. 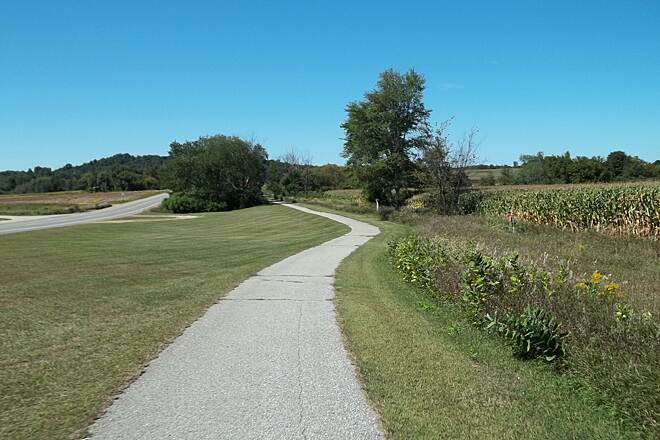 C- and I had a quick look at the trail two weeks back and decided we could probably rollerblade the whole on a good day. Opportunity came with my parents visiting. Started later than we wanted from the big park between Montague and Whitehall (both towns are almost within throwing distance. It looks like the trail goes up the hill here into Whitehall but we didn’t follow it that way). Plenty of parking here, and the obligatory ice cream place here just off the trail near the bridge for pre-trip energy/post-trip catharsis. Met my parents who took the kids over to camp on L Michigan and also took our car up to the Hart trailhead and left it for us. Fresh blacktop here makes for smooth travel, but within minutes transitions to a moderately rough surface that dominated the remaining ~20 miles. Not the kind of rough that rattles teeth, but still puts up a fair amount of resistance. We found that the outsides of the trail were marginally smoother, probably having been worn a bit by northbound and southbound traffic, and so used shorter strokes to keep within the smoother area. A strong south wind gave us a great boost. HOT! And humid, and growing increasingly dark with impending storm. Sweat/sunblock/bug repellent drained copiously into our eyes. Except for frequent, perpendicular fissures across the trail (really, too narrow to catch a wheel) the trail was good - and clear of large debris. Not terribly scenic here but nevertheless a good trip by woodlots, small farms and residential housing. Just before Rothbury (mile ~5 for us) we stopped for water and C- berated me for not bringing more than a small bottle filled only halfway for the two of us. There is a sign at the road here that indicates one could find refreshment a couple blocks into town. We toughed it out. The next few miles brought us into New Era and the welcome Trailside Restaurant. Seems to be the only eating operation on the town block. 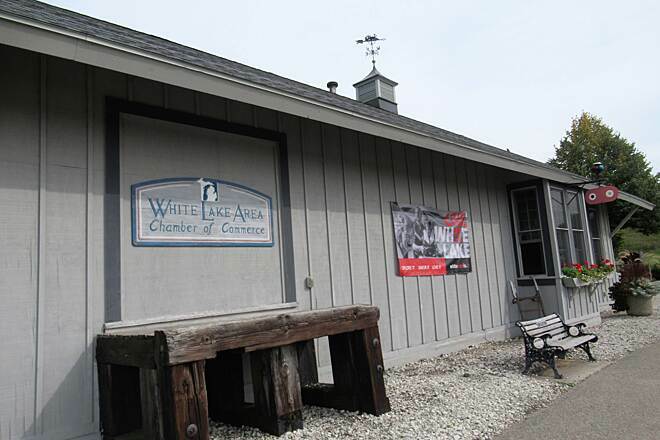 It informally doubles as a museum of those area residents who are serving or have served in the military, and offers a great selection of asparagus dishes (asparagus soup, fried asparagus, asparagus quiche). We opted for the ice cream Sunday (chocolate) instead. 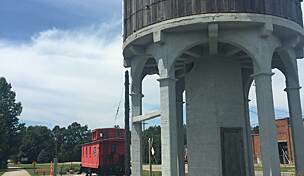 That charged us up for the next few miles into Shelby, a quiet place where the ghosts of the past are thick in the vacant lots of the factory area behind town and Veteran’s memorial park, complete with tank. The way beyond Shelby grew increasingly scenic, through rolling hills, forest and asparagus fields, punctuated by picnic tables good for resting or contemplating. The surface was a bit smoother now too and helped us gain some time. The gathering storm started to break here shooting awesome bolts of lightning across impossibly dark sky. We lucked out with the rain until just getting into Mears. Here one could roll a couple blocks down into town for goodies if so inclined. We kept on, racing the storm and ultimately losing quite decisively within the last couple hundred yards to the car. Drenched, near hypothermic – finally found the key Dad hid under the bumper. Thawing in the car, we decided the trip was a good idea. Total 4h, 15 min including the long snack stop. Recommended trip for intermediates or beginners with good attitude and a day to spend. "Nice,Nice,Nice trail,must ride if you can do it." " Very scenic trail that once ridden on makes me very glad RTC is trying to preserve rail corridors. Being older, the pavement of this trail is narrower than newer trails, but we still rode two abreast when there was no traffic. We rode past many orchards, and got to sample several varieties of apples. Wind is not a factor on this trail because of much tree cover. Wind was 10-15 mph out of WSW. 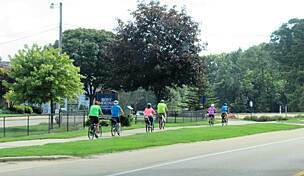 We started in the Whitehall Chamber of Commerce parking lot, rode north to where city streets begin in Hart, and back, total distance 46.7 miles. Bring your fishing rod. We saw a nice King Salmon and a Coho Salmon a guy showed us that he had caught from a bicycle bridge very near the parking lot in Whitehall, casting spoons into a beautiful river that flows into Lake Michigan. We had a great lunch in Shelby at the Wooden Nickel Restaurant, one block off the trail in downtown, and no liquor! Shelby had drinking water on the trail too. New Era, another of the six nice small towns along this trail had a Trailside Restaurant too that we hope to check out next trip. 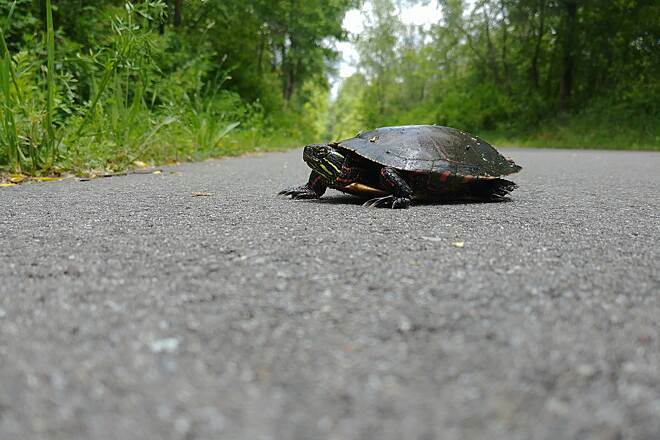 We were very thankful to be able to ride this trail, and hope the DNR will cut the brush back a bit so it doesn't grow any closer to the trail." 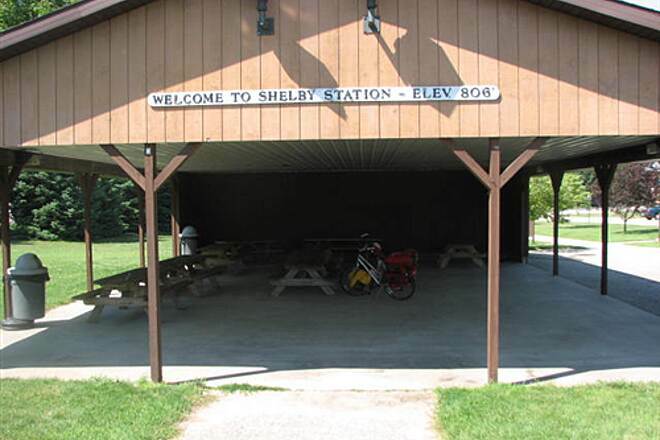 "Beautiful Trail, but . . . ."
"We rode this trail in August 2005 and found it to be beautiful trail, especially north of Shelby where the trail swings out to avoid the high hills around Crystal Lake (which you cannot see from the trail) and before Mears. However we were disappointed to find the water pumps along the trail had had their handles removed and were locked with locks and chains. 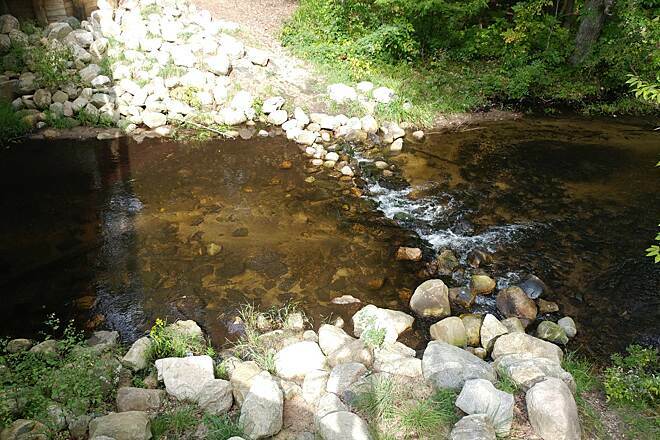 Summer riders need to have access to fresh water as they ride this trail and this forces them to buy bottled Lake Michigan or ground water at excessive prices as they travel this trail. 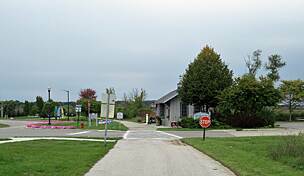 Secondly, we found the restrooms just north of the trail head in Montague, in New Era, and at the trail head by Hanson's in Hart to be closed (in New Era they were even boarded shut). This temps riders to step off the path to relieve themselves and this certainly cannot be healthy. 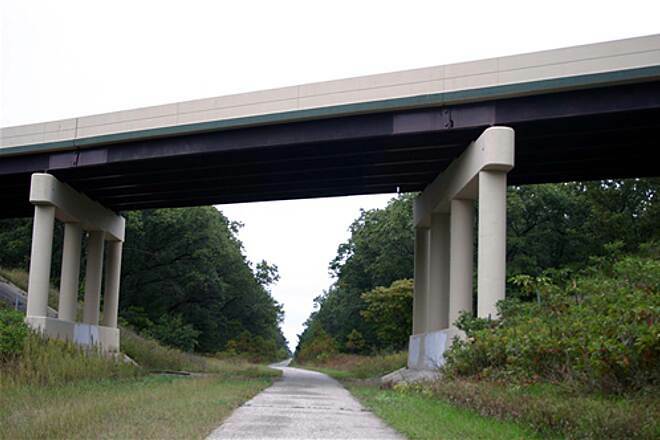 I know Michigan is in financial trouble, but maybe it needs to return to a state wide trail permit system to pay for the maintainence and up keep." 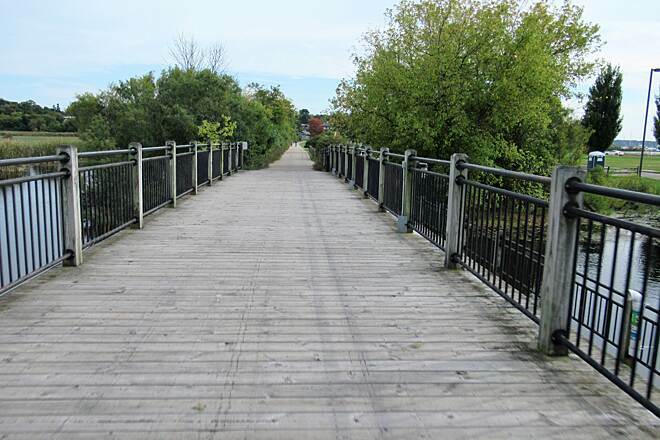 "It's disappointing to see such a great rail-trail being neglected in its historical sense. The misfortunes of the dilapidated Hart Depot was a shock to me and my friends since this was our starting point. The Hart Depot is in great disrepair. The people of Hart received a great gift and they don't seem to care. 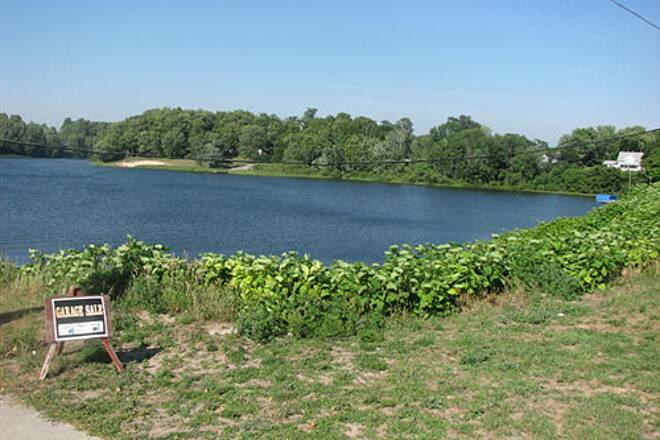 Put some resources into your assets people and make this an attraction, not a distraction." 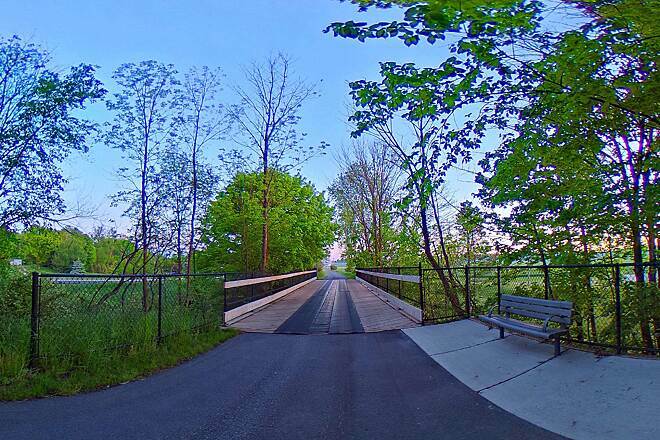 "This trail's north end is supposed to be at John Gurney Park in Hart. 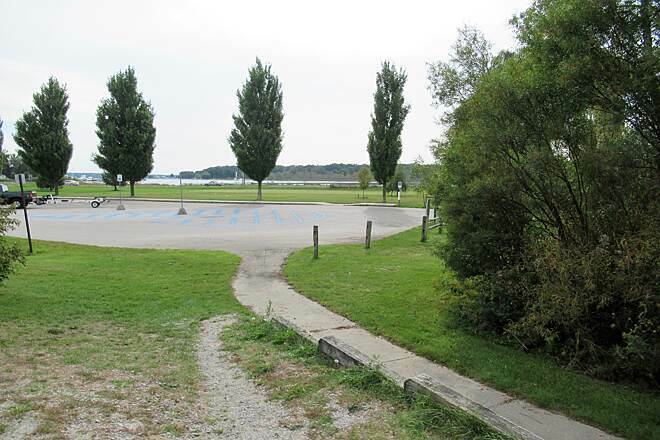 However, only a bicycle route, not well marked, starts at this park; the trail actually begins on the outskirts of town. My husband and I spent two hours looking for one another because none of the 5 people he asked downtown, just a few blocks from the park, could tell him where it was. Also, the segment from Hart to Mears is the least maintained. We recommend starting at Mears, at mile 3, instead, and riding south. There is a wonderful European-style bakery in the center of Mears; the trail crosses the road just south of the bakery. There is a bike rental place where the trail crosses that allows you to park in the shade; they rent bike trailers and recumbents, too. 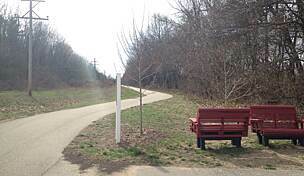 All of this trail is nice from here south, especially the section between Mears and Shelby, which has two picnic tables with wonderful views. " 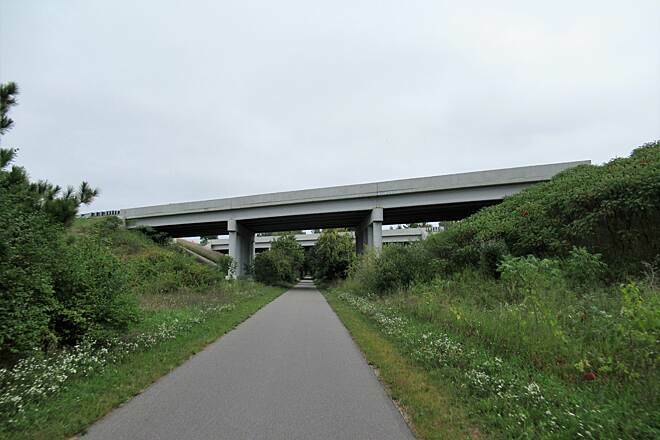 "The only thing that could improve this trail would be to make it longer. I do this trail every july. It's flat, smooth and nicely kept. It's a must do for any moderately seasoned cyclist." 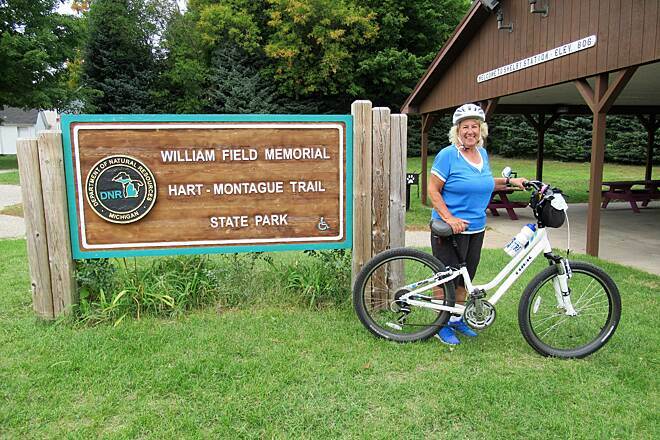 "We started our ride at the visitor's center at Whitehall. We were permited to leave our truck parked over night behind the visitors center. The trail is directly outside the visitor center. It is no longer necessary to purchase a trail pass for this ride. 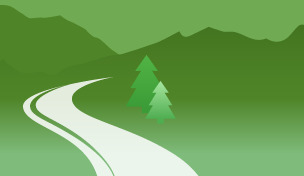 The trail is a very gradual uphill grade for much of the way north. The weather was perfect for our ride. 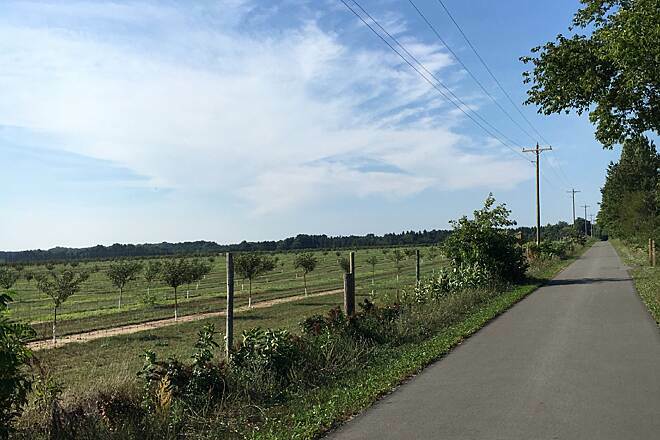 The trail runs through beautiful farm and orchard country as well as some lovely shaded wooded areas. 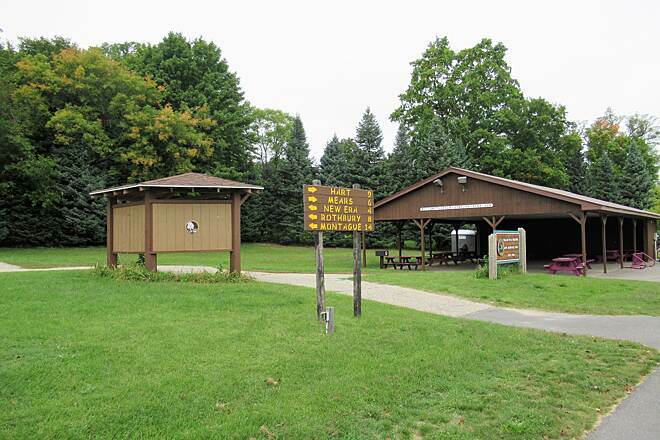 At Rothbury a paved trail spur leads to a nice park with water and clean restrooms. A block north of the park is Dave's Kountry Kitchen. They serve very good blueberry pie, and wonderful fresh strawberry pie. About 1.5 miles past New Era Country Dairy is working Dairy farm that produces and sells hormone free dairy products from a tiny shop almost at the trails edge. They offer free samples of several types of cheese and sell blockes of cheese, milk and cups of perhaps the best ice cream I have ever eaten. The shop is closed on Sundays. The dairy farm also offers tours with advance notice. The Shelby Gem factory is on 6th street within sight of the trail. It offers a short movie presentation in a comfortable air conditioned theater about how Shelby Gems are made. The showroom has many lovely pieces of jewlery available for purchase. The sales staff were friendly and not at all pushy. We spent the night at The Comfort Inn right next to the trail at about the 22 mile marker just south of Hart. The hotel is quite new, very clean and has a great indoor swimming pool and spa which was heavenly after our ride. The hotel offers a nice contintenal breakfast. There is a department store, party store, Subway and McDonald's within sight of the hotel. We rode to downtown Hart for dinner at the Mexican resturant. It is a nice family style place with homemade corn chips and very good guacamole. The next morning we could have practically coasted on the trail downhill back to Whitehall. We stoped at the Wooden Nickle located trailside across from the park in Shelby for breakfast. The food was good with many choices offered and reasonable prices. 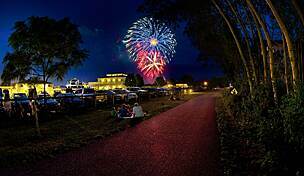 When we returned to Whitehall re realized that the paved trail extends south of the visitor's center but we were unable to determine exactly how far south it ran. 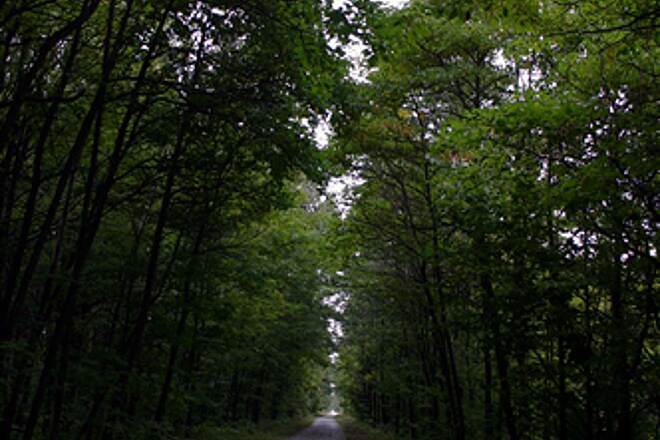 We logged 50.5 miles round trip on this trail and throughly enjoyed the ride." 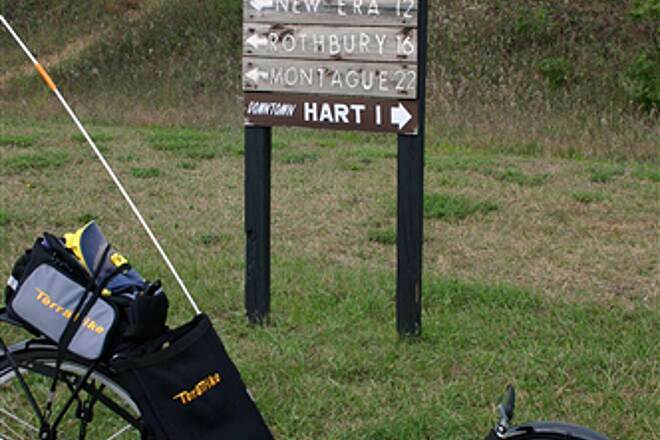 "Dropped off my wife and 8 year old son in Montague, drove north to Hart and rode south. Met up with them at a great little restaurant in Rothbury for lunch, which is about 1/3 of the way (maybe 6-8 miles) north of Montague (have the blueberry pie!). We then rode together back to Hart. Nice smooth trail (for bikes - looks like roller bladers may have some trouble), with several signs posted along the way for refreshments. Quite flat as one would expect from converted rail line. One needs to cross several highways, particularly as you get closer to Hart, but not a big deal, especially if everyone gets *off* the bikes and walks them across the road. My 8-year old actually covered about 25 miles that day on a 20-inch bike. He complained a lot towards the end, but we had a good time anyway. Drove north and spent the night in Ludington, although we could have returned home to Livonia (3 hours) and made it not long after dark (this was the Labor Day weekend). 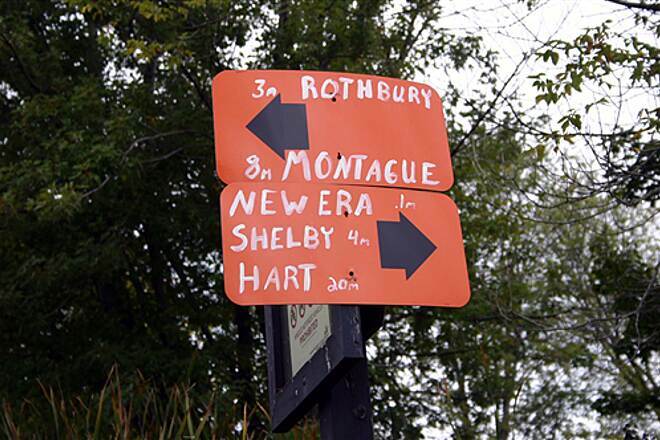 If I were doing this trail on my own, I would park in Montague at the trailhead, and ride the round-trip to/from Montague (maybe stopping in Rothbury for some dinner and a slice of that blueberry pie on the return leg!). 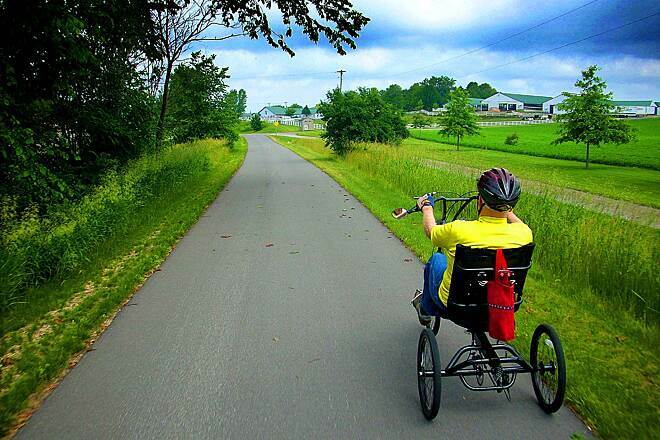 44 miles on a flat trail riding a recumbent bicycle is nuthin'. 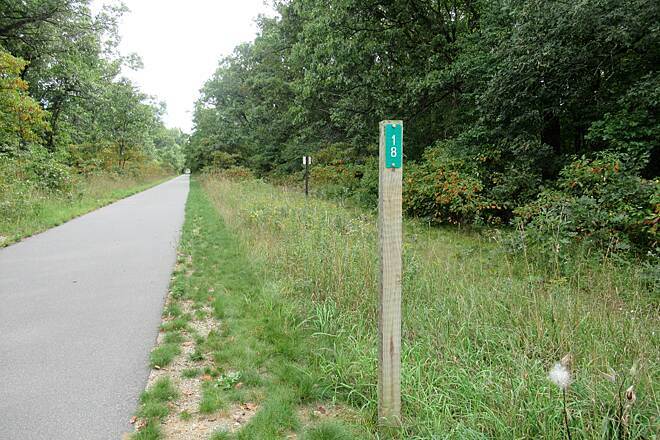 "This trail is great but caution could be used if roller blading. Weather has been hard on it. Numerous cracks, some repaired but whatever is used to groom the snow has put a ""roughness"" to the trail. Nontheless it is a very scenic trail. There is a conflict as per other entry about the snowmobiles. 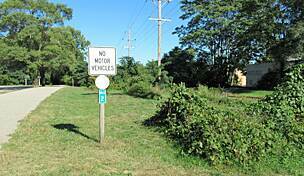 It is posted for them at one point but most trail entries say no motorized vehicles." 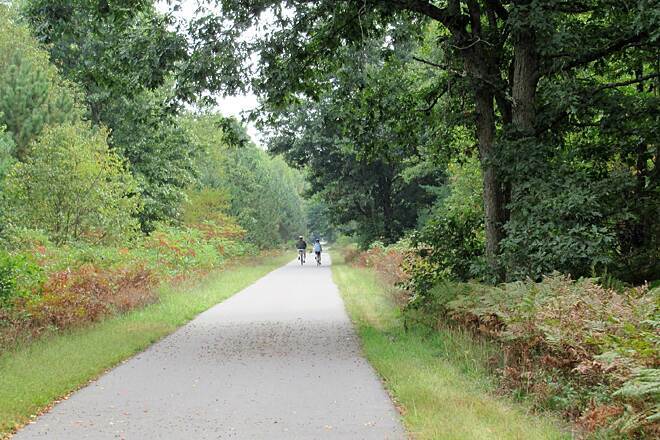 "this is the first and maybe the best State Part Bike Trail in Michigan, very little traffic on it most of the time. 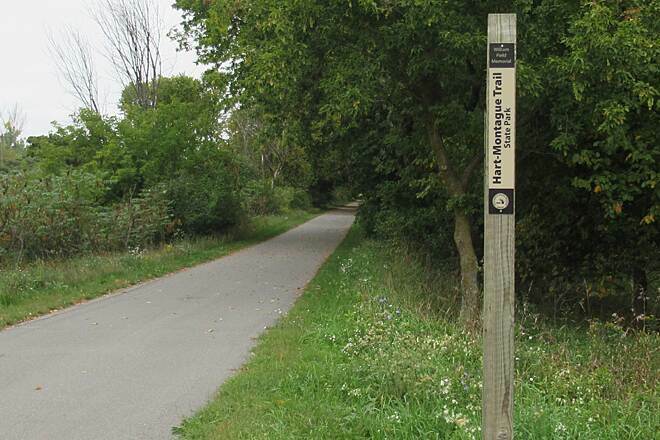 However, contrarty to the posted listing, there is ABSOLUTLLY NO MOTORIZED traffic allowed on this trail AT ANY TIME! this included SNOWMOBILES!, vilolators are ticketed by the State Police."